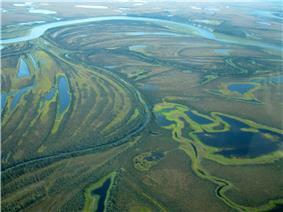 Kobuk Valley National Park is in northwestern Alaska 25 miles (40 km) north of the Arctic Circle. It was designated a United States National Park in 1980 by the Alaska National Interest Lands Conservation Act. It is noted for the Great Kobuk Sand Dunes and caribou migration routes. The park offers backcountry camping, hiking, backpacking, and dog sledding. There are no designated trails or roads in the park, which at 1,750,716 acres (2,735.49 sq mi; 7,084.90 km2), is approximately the size of the state of Delaware. The park is entirely above the Arctic Circle. No roads lead to the park. It is reachable by foot, dogsled, snowmobile, and chartered air taxis from Nome and Kotzebue year-round. The park is one of the least visited in the National Park System. The park is the center of a vast ecosystem between Selawik National Wildlife Refuge and the Noatak National Preserve. It is over 75 miles (121 km) by river to the Chukchi Sea. The Gates of the Arctic National Park and Preserve lie 32 miles (51 km) to the east. The park includes about 81,000 acres (33,000 ha) of lands owned by native corporations and the State of Alaska. The park consists of the broad wetlands valley of the Kobuk River which runs along the southern edge of the western Brooks Range, which is known as the Baird Mountains. The boundary of the park runs along the height-of-land of the Baird Mountains in the north and the shorter Waring Mountains in the south that form a ring, defining and enclosing the Kobuk Valley. The middle two-thirds of the Kobuk River, from just above Kiana to just below Ambler, is included in the park, as are several of its major tributaries such as the Salmon River and the Hunt River. The valley floor is mainly covered by glacial drift. Much of the southern portion of the park, south of the Kobuk River, is managed as the Kobuk Valley Wilderness of 174,545 acres (70,636 ha). The Selawik Wilderness lies to the south, in the adjoining Selawik National Wildlife Refuge. Three sets of sand dune fields are located on the south side of the Kobuk River. The Great Kobuk Sand Dunes, Little Kobuk Sand Dunes and the Hunt River Dunes are remnants of dunefields that covered as many as 200,000 acres (81,000 ha) immediately after the retreat of Pleistocene glaciation. A combination of outwash deposits from the glaciers and strong winds created the field, which is now mostly covered by forest and tundra. In present times the active dune fields cover about 20,500 acres (8,300 ha). The Great Kobuk Sand Dunes comprise the largest active Arctic dune field in North America. NASA has funded their study as an analog for Martian polar dunes. The park's headquarters are at the Northwest Arctic Heritage Center in Kotzebue, about 100 miles (160 km) west of the park on the Bering Sea coast. Seasonal ranger stations are operated along the Kobuk River at Kallarichuk, at the west end of the park, and at Onion Portage at the east end of the park. Offices and visitor services for Cape Krusenstern National Monument and Noatak National Preserve are in the same facility. The units are managed together as the Western Arctic National Parklands, with a single Park Service superintendent in charge. The park lies in a transition zone between boreal forest and tundra. The fish and wildlife in the park are typical of arctic and subarctic fauna. The major economic species are caribou, moose, and fish species such as salmon and sheefish. The most visible animals are the 400,000 caribou of the Western Arctic herd. The herd migrates annually between their winter breeding grounds, south of the Waring Mountains, and their summer calving grounds, north of the Baird Mountains. The herd's annual crossing of the Kobuk River is central to the Inupiaq people's subsistence hunting. Large mammals in the park include gray wolf, caribou and moose. Black bears, brown bears and Dall's sheep exist in the park as well. Smaller mammals include wolverines, minks, porcupines, snowshoe hares and a variety of voles. Fish species include chinook, chum, pink and sockeye salmon, with other salmonids including Dolly Varden, Arctic char, lake trout and Arctic grayling. Other species include burbot, Arctic lamprey, round, broad and humpback whitefish, and pond and rainbow smelt. Weather in the park is subject to extremes. Average low temperatures in January are −8 °F (−22 °C), and can reach nighttime lows of −50 °F (−46 °C). Summer temperatures average around 65 °F (18 °C), and can reach 85 °F (29 °C). Since the park is above the Arctic Circle, the sun does not set from June 3 to July 9, and the sun is visible for only 1-1/2 hour on the winter solstice, with long periods of twilight on either side of sunrise and sunset. As is the case over all of northern Alaska, the aurora borealis is often visible on winter nights when solar activity is high. Snow can happen at any time of the year. Wind and rain are common in summer. Human habitation in Kobuk Valley is believed to extend back at least 12,500 years. 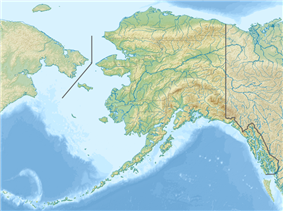 The present inhabitants of the valley are the Inupiat people, who subsist on hunting and fishing in the region. The Onion Portage Archeological District is a National Historic Landmark district at the east end of the Kobuk River's course through the park. The site, strategically located at a major caribou river crossing, documents nine cultural complexes spanning from 8,000–6,000 BC to about 1000–1700 AD. The site is an inhiolding of the NANA Regional Corporation, an Alaskan native corporation with rights in the park. The first human inhabitants of the Kobuk Valley were people of the Paleo-Arctic Tradition, who hunted caribou at Onion Portage. The region was apparently deserted for about 2,000 years until people of the Archaic tradition appeared in the valley from the south and east. By about 4,000 years before the present, people of the Arctic Small Tool tradition arrived, but departed between 1,500 and 1,000 years ago, again leaving the valley unoccupied. New people arrived by about 1200 AD, as documented by the Ahteut site 25 miles (40 km) downriver from Onion Portage. People remained in the valley until the mid-19th century, when the caribou population declined and people moved closer to the coast. These people were the Akunirmiut and Kuuvaum Kangiamirnuit. One of their villages was located in the present park at the mouth of the Hunt River. Their descendents, now known as the Kuuvangmiit, have mostly moved out of park lands. About 32 prospectors' camps were established during a short gold rush in 1899–1900. Surveys have not yet located them, although debris associated with the miners' boats has been found. Kobuk Valley National Park was established as one of fifteen new National Park Service properties established by the Alaska National Interest Lands Conservation Act (ANILCA) of 1980. It was first declared a national monument by President Jimmy Carter on December 1, 1978 using his authority under the Antiquities Act when Congressional negotiations on the proposed ANILCA bill were stalled. ANILCA was finally passed in 1980, and signed by Carter on December 2, 1980. Unlike many Park Service units in Alaska, Kobuk Valley is entirely national park land, with only subsistence hunting by local residents permitted. No part of the park is designated as a national preserve, which would allow sport hunting. The Great Kobuk Sand dunes located in the Kobuk Valley National Park in northwestern arctic Alaska. ^ a b "NPS Annual Recreation Visits Report". National Park Service. Retrieved 2013-02-21. ^ a b c d e f g "Cultural Resources of Kobuk Valley National Park". National Park Service. Retrieved 23 February 2013. ^ "Kobuk Valley Wilderness". Wilderness.net. Retrieved 21 February 2013. ^ "Sand and Glaciers". Kobuk Valley National Park. National Park Service. Retrieved 21 February 2013. ^ Dinwiddie; et al. (May 2010). "Sand, Wind and Ice: Mars Analog Aeolian Studies at the Great Kobuk Sand Dunes, Alaska" (PDF). Second International Planetary Dunes Workshop. ^ "Operating Hours and Seasons". Kobuk Valley National Park. National Park Service. Retrieved 21 February 2013. ^ "Kobuk Valley National Park Map". National Park Service. ^ "Operating Hours and Seasons". Cape Krusenstern National Monument. National Park Service. Retrieved 21 February 2013. ^ "Operating Hours and Seasons". Noatak National Preserve. National Park Service. Retrieved 21 February 2013. ^ "Northwest Arctic Heritage Center, Kotzebue, Alaska". Kobuk Valley National Park. National Park Service. Retrieved 21 February 2013. ^ Quinley, John. "Superintendent Named for Western Arctic National Parklands". Kobuk Valley National Park. National Park Service. Retrieved 21 February 2013. ^ a b "National Historic Landmarks". Kobuk Valley National Park. National Park Service. Retrieved 21 February 2013. ^ "Mammals of Kobuk Valley National Park". Kobuk Valley National Park. National Park Service. Retrieved 21 February 2013. ^ "Fish Species of Kobuk Valley National Park". Kobuk Valley National Park. National Park Service. Retrieved 21 February 2013. ^ "Weather". Kobuk Valley National Park. National Park Service. Retrieved 21 February 2013. ^ "Kobuk Valley National Park General Management Plan". National Park Service. 1986. p. 3. Retrieved 21 February 2013. ^ "Management". Kobuk Valley National Park. National Park Service. Retrieved 21 February 2013. ^ "Things to Know Before You Come". Kobuk Valley National Park. National Park Service. Retrieved 21 February 2013.